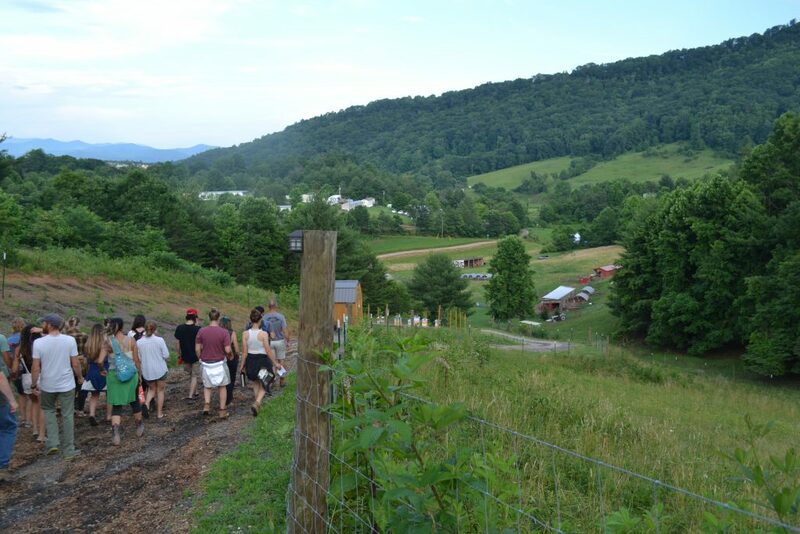 Franny’s Farm was a great spot for our June CRAFT Twilight Farm Tour on Agritourism. We gathered in the early evening, Franny welcomed us, and quickly we set off on a tour of their operation. Franny explained that she and her partner Jeff bought their land in 2012 with help from a USDA Farm Service Agency Loan and set to work establishing Franny’s Farm along with their son. They kicked things off with a barn raising, and have continued to build all of the infrastructure on the farm themselves. When they first started they intended for produce and livestock to be their primary enterprises, but then had the opportunity to host the “Barnaroo” music festival shortly after. Their agritourism enterprises have continued to grow ever since. Now they’ve downsized the garden and are able to market their produce and meat to a few restaurants and to guests through the farm store. This year they are growing two acres of industrial hemp as part of NC’s Industrial Hemp Commission Pilot Project. Livestock wise they raise sheep and goats and are breeding Heritage Barred Rock poultry that Franny ships as chicks all across the country. They also have two Red Wattle pigs named Dumpling and Donut. “Agritourism is our bread and butter,” Franny said, “plus I love to party, have a good time, and listen to music so having it as a part of the farm made sense for us.” They own 33 acres total, and 5 acres make up the “event center.” In addition to the livestock and garden, their enterprises include events, weddings, lodging, summer camp, and the music festival. Barnaroo is their biggest event by far. While it’s not the biggest money maker and does take a good amount of time to plan and put on, Franny feels like the partnerships they have formed and how much it gets the word out about their farm makes it worth it. They are also hosting 8 weddings this year, as well as several weeks of summer camp. Additionally, folks can rent the space on the farm for bridal or baby showers, book clubs, spring breaks, meetings, or even yoga with goats! They have been using Air BnB and offering lodging on-farm for three years, and it is what drives the farm financially now, Franny explained. Franny and Carissa, the full-time manager, are the key staff day-to-day. For lodging, they have two eco-cabins, four permanent camping tents, and a living space above the barn. 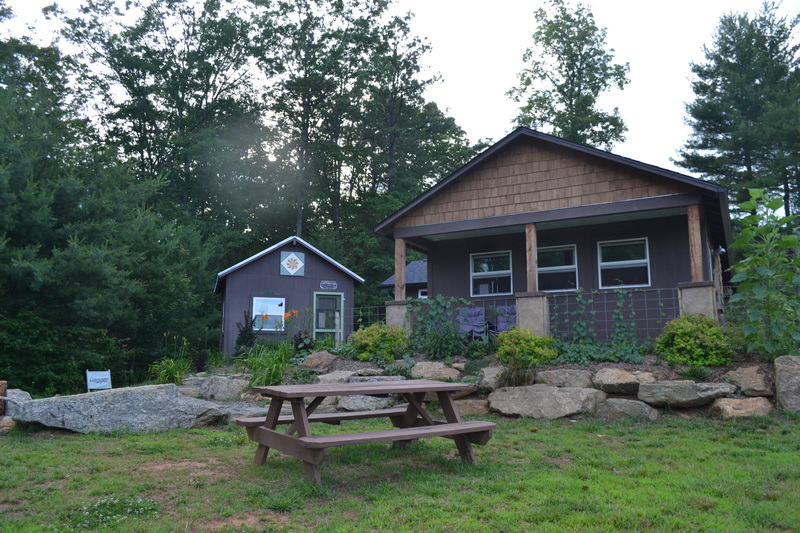 All of the campsites and cabins are off the grid using only solar power. Guests share a community kitchen, bathroom, and utility room. The camping tents are utility tents that cost about $800 retail atop a wooden platform they built for about $300. They are unfurnished and cost $35/night. The eco-cabins are 10×12 ft. buildings with a loft, each one cost about $10,000 to build since they did all of the labor, and the cabins are permitted. However, You are not required to have a permit for any structure 10×12 ft. or smaller. Both cabins have a queen and twin bed available and cost $65/night on weekends and $55/night on a weeknight. 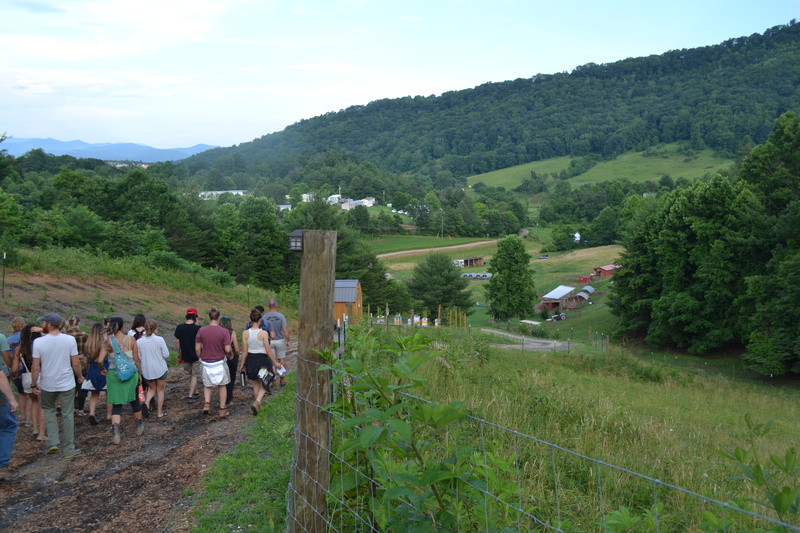 Guests can acquaint themselves to the farm with a self-guided tour, but all the gates to pastures say “Employees Only” in an effort to keep them away from the animals. Camp kids, however, are allowed with the animals with supervision as a learning lesson. Franny also talked about how much thought and time she has put into market research and setting their prices. She checked out what other camping, cabin rental rates, and accommodations were in the area and figured out her costs ahead of time before building. Knowing that she needed to have a relatively quick return on investment, and knowing what they can reasonably charge she had a better idea of how long it would take to earn their money back, as well as helped them decide what was worth doing and what wasn’t. When they started to host weddings she learned that there are 185 farms with wedding venues in Buncombe County, and 300 venues in Asheville alone. So, by knowing her market and pricing ahead of time she had a realistic view what to expect starting out. Franny stressed that just because you put it out there, doesn’t mean it will succeed. “We have to build it. We’re farmers, we plant seeds,” she said enthusiastically. Another key idea that Franny stressed was communication. While effective communication can be challenging, it’s imperative to communicate clearly and often with your guests, campers, interns, etc. Which is why they have plenty of signs up across the farm directing folks where it’s okay for them to be and where it’s not, how to get around, and any liability concerns – which the insurance company likes to see. She also makes an effort to interact with the guests at some point during their stay. She’s found if they are unhappy and they meet her they aren’t going to leave angry. Get keypads for the cabin. Then guests can let themselves in with a key code. It’s okay not to do everything yourself, which is where strategic partnerships can come in. For example, Asheville Bee Charmer manages their beehives on the farm. A good philosophy, “under promise and over deliver” so that people are pleasantly surprised. The most sage advice that Franny shared is to be true to who you are and start small. Much of Agritourism, especially if you’re looking to have vacation rentals on your farm, is a hospitality job. That can require being available 24/7, and dealing with people who don’t know how to be on a farm. For Franny, her passions are working with kids, education, farming and having a good time so shifting her enterprises to concentrate on agritourism as a way to support the farming enterprises and promote community was a natural fit. If venturing into agritourism is what you decide to do, then don’t wait until you have everything figured out to start. “Roll with it as you go,” said Franny, “and start small.” They started by having campsites at Barnaroo, upgraded to permanent camping tents, and then eco-cabins. It’s a series of trials and errors, learning by making mistakes. Build your market, your skills, and determine what works for you as you grow. Our thanks to Franny and Jeff for making time to host us on the farm and sharing insights. It is always such a pleasure to see a farm from the farmer’s perspective. Thanks again! Hope to see you at the next one.